I’m really hoping that the Star Trek Typhon Pact tie-in novels aren’t going to suffer from the odd-numbered curse all the way through, because I don’t think I can handle spending another $8 on book five if it’s going to be as disappointing as Rough Beasts of Empire, the third book in the saga. I had really hoped Empire would be great. After all, the author, David R. George III, wrote what was to my mind the best installment in the Lost Era, Serpents Among the Ruins (if you like Trek and you haven’t read it, you should rectify that situation immediately). George has also written other very enjoyable books in the Trek universe. But, unfortunately, this Typhon Pact novel just doesn’t cut it. I’m usually a fan of multiple interlocking stories that come together at the end. I even liked Love Actually, despite the extremely-tangential way some of the storylines touched each other. But compared to Empire, that film’s stories were completely intertwined. There are four distinct stories in Empire, and the only way to explain them is to keep them separate, like they are in the novel. The Tzenkethi. As with the other Typhon Pact novels, Empire exists to show us a Star Trek race that we haven’t seen. The Tzenkethi are a merit-driven caste society of beautiful beings with no bones and a very unique approach to the use of floor (and ceiling) space. Their names are so complex that I can’t even remember what the main Tzenkethi character was called. Something with an A at the end. Anyway, this Tzenkethi was sent to be the Typhon Pact’s ambassador to Romulus, although she had a secret mission. Which was addressed so infrequently that I totally forgot about it until the very end. Vulcan-Romulan Reunification. Spock is still on Romulus, trying to bring both sides together. This was by far the least interesting of all the storylines because, (a), we’ve been dealing with it in novels for far too long and, (b), we know it’s never going to succeed. 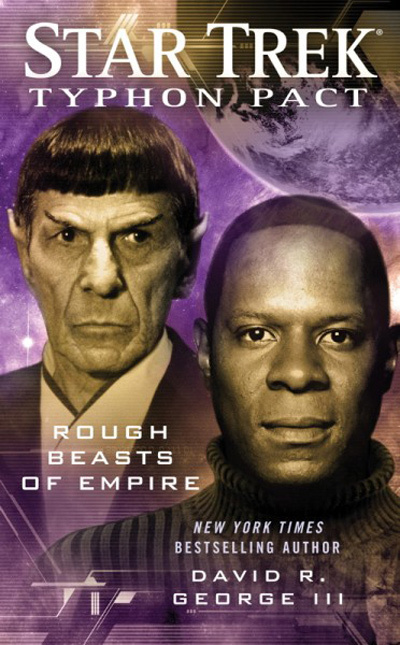 It’s just an excuse to get a picture of Leonard Nimoy on the cover of the book. In any case, an assassination attempt is made upon Spock, which leads him to approach Praetor Tal’Aura* with a groundbreaking proposal. The Romulan Senate. The Ortikant family, led by Gell Kamemor**, is heavily involved in the reformation of the Romulan Senate under Tal’Aura. Captain Sisko. I firmly believe that this is the story George wanted to tell when he started writing this book. It is the most interesting, the most nuanced, and the most compelling. In the beginning, we see Sisko commanding the starship New York during the Borg war in Star Trek: Destiny. This actually happens before the first two Typhon Pact novels, which confused me at first, but I got over it. Anyway, after the battle, Sisko goes home to Kasidy and his family, but remembers that the Prophets told him he would only know sadness if he made a life for himself on Bajor. So he makes the questionable decision to leave Bajor and return to Starfleet. He is assigned a starship on patrol along the Romulan border, where he becomes Emo Sisko. There’s also several minor sub-plots, including the return of a somewhat-overused-as-a-plot-device character, the summit between Empress Donatra and Praetor Tal’Aura, the observations of Senator Durjik, and an out-of-nowhere flashback to Sisko’s experiences during the last Tzenkethi conflict which completely pulled me out of the story. I realize I’ve been pretty negative overall, but mostly what I’m negative about is the plot and the story. George’s writing is still top-notch, even when he’s dumping scads of exposition, and as with the other Typhon Pact novels there are plenty of hooks into other Star Trek shows and books that fans will remember and recognize. I just don’t think this book was interlaced enough with its A and B plots to really interest me; therefore, I’ll have to recommend that you give this one a pass and just read the spoilers online. * You may remember her from Star Trek: Nemesis as the Romulan woman who left the Senate chamber just before everyone turned into stones and crumbled to dust. * See Serpents Among the Ruins, where she was the chief Romulan negotiator on the Treaty of Algeron, best known for preventing the Federation from developing or using cloaking devices.